I suggest that it’s not WHAT people think that’s dividing the country, it’s HOW people think. The divide is not A Conflict of Visions or ideologies or sacred values per se. Those are effects. It’s a conflict of cognitive styles, psychological profiles, operating systems if you will. These are the causes from which the effects follow. The Teloses of Social Justice and Truth described in this lecture…..
…could as easily be metaphorically characterized as the the cognitive styles of Platonic idealism and Aristotelian empiricism . I’d even be so bold as to suggest that the latter metaphor is more accurate from the standpoint of psychological social science. I suggest that the popularity of Jordan Peterson, Lindsay Shepherd, the Weinsteins, Gad Saad, Camille Paglia, CH Sommers, The Prager U videos, Prager himself, Tim Keller, and even folks like Dave Rubin and Ben Shapiro, is because they’re critical thinkers. They’re Aristotelian empiricists. Their ideology itself is almost immaterial. They offer refreshing clarity and direction in a world of anomie and chaos. Students in particular and people in general are starving for it. It’s true that the Telos of Social Justice is incompatible with the Telos of Truth. But it’s ALSO true that the Telos of Social Justice is incompatible with education itself, whereas the Telos of Truth epitomizes it. In my experience out here in the business world the people who get ahead tend to be the clear-thinking Aristotelian empiricists. In a recent tweet somebody suggested to Heterodox Academy the idea of starting a new university with all the ousted professors. If that hypothetical school were to become reality it would be inundated with applications, and graduates would become the stars of the business and political worlds. I sense a great opportunity somewhere in all this; a market demand, so to speak, that’s begging to be filled. 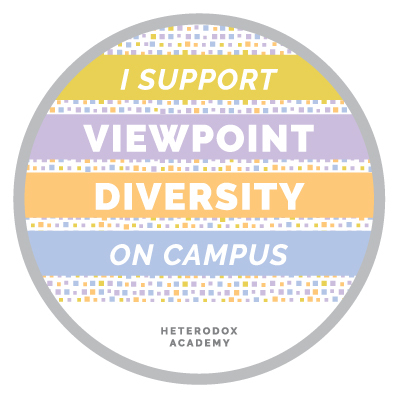 Viewpoint diversity alone can’t fill it. Viewpoint diversity alone suggests intellectual equivalence between the two ways of thinking; it normalizes unequal things. It suggests that the Coddled thinking of the Platonic idealism – the Telos Social Justice – is as valid and rigorous and worthy as is the disciplined thinking of the the Aristotelian empiricism of Telos of Truth. I suggest that this Procrustean intellectual equivalence between unequal things confuses students more than it helps them. They’re begging for clarity but getting hand waving and obfuscation, apparently in pursuit of some sense of “fairness” that on the long run is actually UNfair. I suggest that what CAN fill it is for somebody somewhere to get off the fence and pick a side. Talk about the elephant on the room. Call it out, expose it for what is. Teach, require, demand the enlightenment norms of evidence and argumentation; the Telos of Truth. Don’t just *say* that “entrenched yet questionable orthodoxies” exist. Take the next step. Proactively seek out and destroy them. They’re intellectual land mines that damage political discourse. Replace them with reality as we know it. The Righteous Mind does this superbly. Teach it. Use it to defuse the mines. Just recently discovered your blog. You have a new fan. I just recently retired from Engineering after 40 years in it. Despite our “materialist” and scientific education, I find that our field is also changing in its leaning to leftward thinking. In the 70’s nearly all my colleagues would have called themselves conservatives. That is no longer true. Since the curriculum of engineering students today is nearly the same as it was 30-40 years ago, with very few liberal arts classes, how are they being acculturated with this new thinking? Is it just in the air and a critical mass infects all despite never having been exposed to it? Or did it start early, perhaps in middle and high school and the engineering students come to universities already primed? Jonathan Haidt wrote that The Yale Problem Begins in High School. I disagree, and wrote The Yale Problem Begins in Kindergarten. Thanks for asking and the kind words. No they didn’t kick me off. I was close to giving up on it anyway. When they switched to the new website I elected not to register. O Also, with all the fancy graphics the web site seems much slower and more cumbersome. Might write more about this later.